This collection of chemical and molecular structures has been assembled to help students explore chemicals that elicit a sense of heat and/or pain by binding certain receptors. 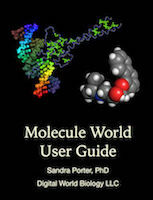 All the chemical and molecular structures below can be viewed in Molecule World on the iPad or Molecule World for iPhone. Receptors for capsaicin and wasabi, and capsaicin, wasabi, and spider toxin. Use the link on the right to download all the structures at once. Capsaicin is a chemical made by chili peppers that contributes to a sensation of heat. Capsaicin receptor, also called the TrpVI Ion channel. Capsaicin receptor bound to spider toxin. The "double-knot" spider toxin binds to the TrpV receptor and causes a sensation of heat and pain. TrpA1 ion channel. Allyl isothiocyanate from wasabi binds to this receptor and causes a sensation of heat and pain. Allyl isothiocyanate is the chemical in wasabi that creates a sensation of heat.